On the fifth year anniversary of the devastating earthquake in Haiti, Vocational Rehabilitation shares a story of how Alcinor Aurelien reinvented himself in America. 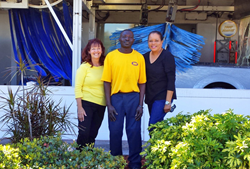 Left to Right: Job Coach Linda Lennox, Alcinor Aurelien, and VR Senior Counselor Frances Branch stand in front of Mister Car Wash.
Alcinor is my best worker. He is the first one there every day and the last one to leave. Alcinor has never complained, always does an outstanding job and never misses work. Alcinor Aurelien was home alone when suddenly the ground began to shake violently and with a thunderous sound, his house began falling in on him. It was January 12, 2010 and a 7.0 earthquake was shaking Haiti unlike anything before. As the quake subsided, Alcinor found himself buried in concrete debris, and began trying to pull himself out. The more he tried, the more he realized that his left leg below the knee was completely crushed under the concrete, and he could not get out. When rescuers reached him, unfortunately, they also could not remove the concrete from atop his leg. Rescuers removed his leg below the knee by guillotine amputation on site and later transferred him to a makeshift hospital. It was there he learned that his mother and young daughter did not survive the quake. The quake claimed 230,000 lives and left at least 1.5 million people homeless. Two weeks later, he was airlifted to Tampa General Hospital where surgeons performed a clean amputation due to extreme infection and also began treating his acute blood loss anemia, malnutrition, and liver damage. He barely survived as the bacterial infection became severe. Within two months, he was stable enough to transfer to a rehab facility. He was fitted with a simple prosthesis, what many have called a “peg leg.” He worked hard on his rehabilitation, and Catholic Charities helped him find temporary housing. He found out about Vocational Rehabilitation (VR) though another Haitian friend who was also working with Catholic Charities and applied in July 2012. It had taken two years to become well enough to even attempt to work. He was assigned to Sr. VR Counselor Frances Branch at the downtown Tampa office. She helped him to get a lifelike and more functional prosthesis, and also sent him to an eye surgeon for removal of a not previously detected object lodged in his eye from the earthquake. She also provided him with eyeglasses after a vision test showed extreme myopia. Linda quickly found a job for Alcinor working at Mister Car Wash. She also helped him get a Florida I.D. and an extension on his visa. The owner of the business became a wonderful mentor to Alcinor, teaching him how to do his job and also helping him with his English. Alcinor has reciprocated by teaching his supervisor Creole. Although he still struggles with English, he can now carry on a conversation and has made great strides in his two years with VR.